The Blacklist is one of my favorite shows. It, and the characters, all revolve around Red Reddington, an immaculate, eloquent spy turned criminal who surrenders himself to the FBI in return for…well, that would be telling. Quickly evolving into a byzantine conspiracy story with a gleeful fondness for the unexpected and an elegant Caliban at its heart, it’s immensely clever, nasty fun. It’s also just come to comics, thanks to Titan. Written by Nicole Philips, script coordinator for the first two seasons of the show. I talked to her about her work on the show, the comic, the challenges of getting Red onto the page and how the comic and show tie together. Could you tell us a little about your role on The Blacklist writing staff? I joined Blacklist in Season 1 and worked two seasons as the show’s script coordinator. Script coordinators function as a liaison between production and the writing staff, so they’re the ones maintaining continuity, compiling scripts, integrating revisions, etc. I learned a ton from doing that job — then for Season 3 I was officially promoted as a staff writer on the show. I’d recommend any aspiring tv writers try script coordinating, you just absorb so much about crafting scenes/dialogue/character from seeing how the scripts evolve between drafts. It’s a gloriously complex, Byzantine show. How is the writing broken down? Is it by episode or arc plot? It’s really a combination of both. Jon Bokenkamp and John Eisendrath, who run the show, usually start the season with general trajectories in mind for our characters — “How will Red/Liz suffer this season?” — then it’s our job as a staff to come up with stories that serve those arcs. And inevitably things ebb and flow as the season goes on. The hardest part by far is creating new and interesting Blacklist villains — but our goal is always that they reflect some problem our characters are going through, as opposed to being cool for coolness’ sake. Also I love that you used the word Byzantine, I wish that popped up more in my everyday conversations. Two years in the staff have done an excellent job of teasing out some revelations while revealing others. How hard is it to maintain the balancing act of reveal versus narrative progress? It’s hard because we want to reveal everything right away! But whenever we get questions from fans like “Is Red Liz’s father?” they usually follow with “No, wait, don’t tell me.” People don’t really want just answers, they want those answers to come out organically, when it’s right for the story, when those revelations will affect our characters in the most impactful way. So anything we’re holding back — rest assured we’re holding it back for a reason. Is there a particular scene or moment you’re proudest of in your work there so far? I’m actually incredibly proud of the comic. 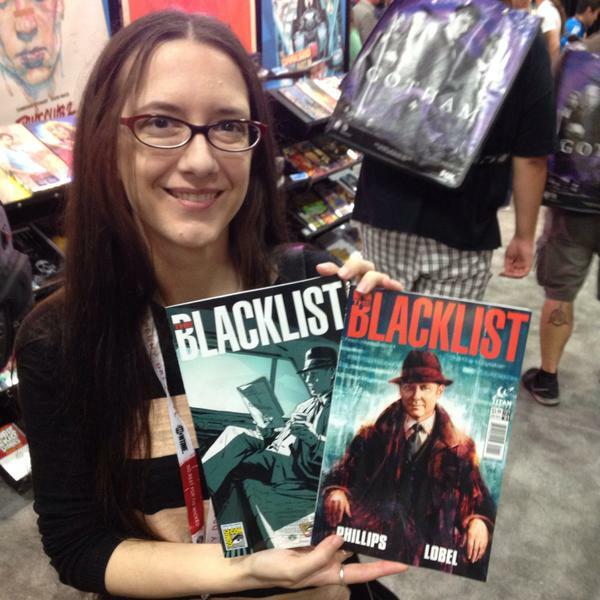 I’m a reader and it’d been a goal of mine since Season 1 to translate the Blacklist world into a comic series. There’s no limit there to the scope of stories you can tell, your artist can literally bring ANYTHING to life, and there’s an opportunity to showcase smaller character moments and backstory that may not gel with the flow of a 60-minute TV episode. Plus I’m having a blast writing them and hopefully that joy is obvious on the page when fans are reading. Red is a wonderful, Shakespearean character. What are the challenges in taking him from the screen to the page? Haha, the biggest challenge is definitely balancing his dialogue, as my editor at Titan will tell you. On the show Red tends to wax philosophic a lot, has grand soliloquies, tells lots of stories, etc. That’s just the voice of the character. But sometimes, on a comic page, that dialogue will translate to 50+ word bubbles covering up all the art. It’s a tightrope to walk. Are any characters particularly resistant to that transition? Dembe was difficult at first, because he’s such a stoic character and so much of his personality shines through the performance of Hisham Tawfiq. Without much dialogue, hints of Dembe’s inner world have to come out in other ways. For example, in Issue #2 he’s reading a book – and the title of that book isn’t coincidence. Also our artist Beni Lobel knocked Dembe’s likeness out of the park. What’s the plan for the first year of the comic? The first five issues of the comic are one story arc with a single major Blacklister, which ties in with the latter half of Season 2 — then Issues #6-10 will be a whole new story that ties in with Season 3 (premiering September 24th). Will it tie back into the show? With elements introduced there appearing on the screen later? We’ve talked about that. The comics are canon so there is the potential for characters introduced in the comic to reappear later — or events in the comic to have a ripple effect for the show. It would certainly be cool, I wouldn’t rule it out. -What’s your dream episode, in print or on screen, the one full bore crazy idea you’d love to do? Three words. Reddington. In. Space. No, seriously, it’s a dream to be writing these stories right now. As for my other crazy ideas… keep reading the comics. A lot of them turn up in there. Immense thanks to Nicole for the great answers and to Lucy at Titan for setting it up. The Blacklist season 3 begins later this year, Seasons 1 and 2 are available now and click over here to get the comic.